Background: Elastography can be considered as a technique for imaging-based palpation. Since ages long before the advent of diagnostic modalities, palpation has been fundamental for the assessment of tissue’s health. The high sensitivity of the palpating hand is related to the scaling properties of mechanical constants in biological tissue. In particular, the macroscopic shear modulus is capable to communicate the micro-mechanical properties of cellular networks across a continuum of scales. Other than classical MRI or ultrasound, elastography is based on quantitative structural properties of tissues which – as is known by our haptic sensation – can tremendous change with disease. Problem: To date one major limitation of clinical MRE is the current driver technology, which relies on Lorentz coils or loudspeakers, imposing either field distortions, which limit the applicability of fast echo-planar-imaging (EPI) sequences, or requiring rods and tubes for the transmission of vibrations from distant wave sources to the organ under investigation. A further obstacle is that spatial maps of viscoelastic parameters still lack consistency. These so-called elastograms are regularly limited by severe artifacts due to wave nodes or low amplitudes, resulting in unreliable regions where no elastic deformation can be achieved. Such uncertain regions have to be identified and masked to avoid biased stiffness estimates. 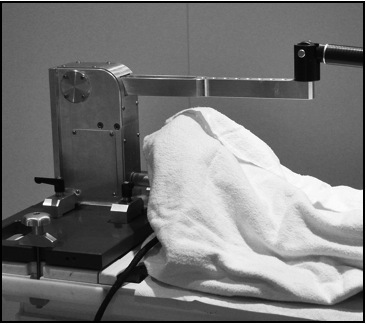 1) We developed a semidistant driver which can be placed at the end of the patient table (Fig.1). 2) A fast 3D EPI-based acquisition of vibration fields enables us to repeat the experiment at multiple drive frequencies in a short time. A typical set of data comprises 10 to 30 image slices, three vector components of the harmonic wave field, 8 time steps and 4 to 7 vibration frequencies. The image resolution is isotropic from 2 to 2.5 mm voxel size. 3) The multifrequency 3D MRE data (3DMMRE) is analyzed by a novel multifrequency dual elasto-visco (MDEV) inversion algorithm capable to compensate for interferences regularly occurring in time-harmonic wave fields. By these three points we achieved MRE with higher spatial resolution and improved consistency than previous work towards a precise image-based palpation of the human body (Fig.2). Figure 1: Nonmagnetic driver, here for MRE of the liver. 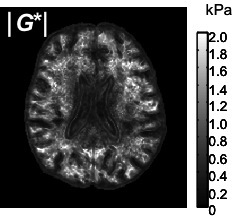 Figure 2: 3DMMRE with MDEV inversion: Mechanical map of the brain with 1-cubic mm resolution displaying the magnitude of the complex shear modulus.